Ever wondered what cordial has to do with engaging with your prospects? - TI Accountancy Ltd. Ever wondered what cordial has to do with engaging with your prospects? No? Me neither till last week when I stumbled across a way to get great Facebook engagement with no cost at all… well except to my pride. While my ever patient other half was making lunch in the kitchen I went to refill my glass with Vimto, after putting the water in the glass and going to get the cordial bottle he turned to me and said; “what kind of person puts the water in first?”. To which I replied “err …. normal people”. After a 10 minute debate where both of us were adamant we were the normal one I did what any respectful business woman would do… I took to Facebook. Over the next couple of hours Lee’s phone never stopped pinging, as he’s someone who doesn’t do Facebook very much he still has his notifications on!!! The response was overwhelming, everyone seemed to have an opinion on what you put in first the cordial or the water. People I hadn’t spoken to in over 2 years were commenting and people I had never engaged with on Facebook had felt compelled to press the vote button on my poll. 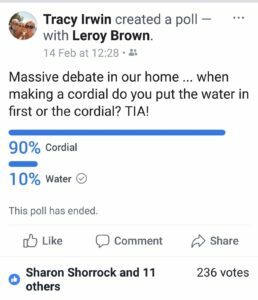 On top of being surprised that I lost by a landslide 90% to 10% in favour of cordial first (I’m not used to being wrong!! ), there were TWO key takeaways for me..
As a whole we’re predictable. The whole week that the vote was on the percentages never fluctuated more than 1%, for every 9 people that put cordial 1 put water. From a business point of view this highlights that there will always be that certain percentage in your target market that sees things differently and you need to decide whether you’re targeting the 90% or the 10% and then adapt your messaging differently to each sector. I should have been ready with a promotion. Facebook shows you more posts from people with whom you have engaged with. Now I know I’d got my 236 vote by accident but it’s worth remembering from a business point of view all these people will now see my posts for a certain time until they no longer engage with me. This would have been the perfect opportunity to share business posts and do promotions to build the business and if my target audience was in my Facebook list to keep the engagement going. Like I say the poll really was just a debate between Lee and I, but can you imagine how much more engagement you’d get on your promotion after a well thought through poll to re-engage your contacts?